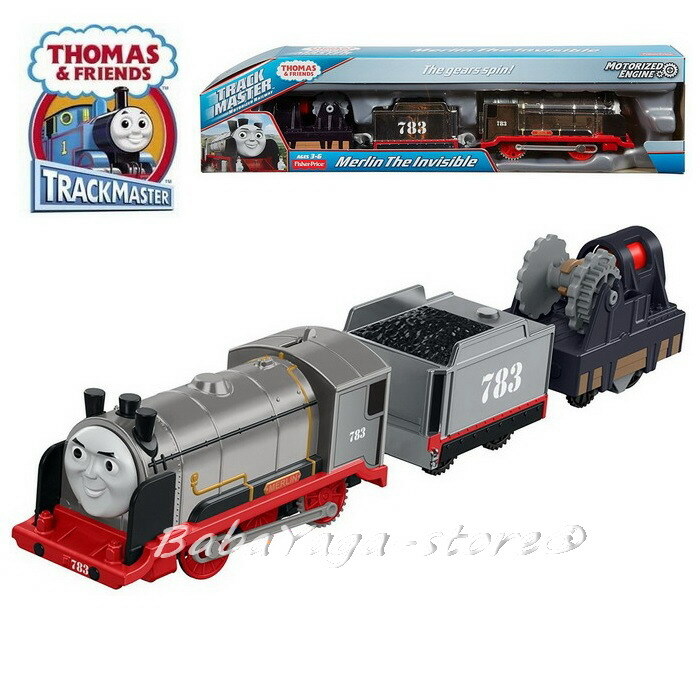 In the Thomas & Friends™ DVD movie, Journey Beyond Sodor (sold separately and subject to availability), Thomas meets a variety of strange experimental engines when he travels to the Mainland. One of the most unique is Merlin the Invisible, a stealth engine designed to be hard to see. This TrackMaster™ motorized toy train from Fisher-Price lets children bring the character to life by recreating their favorite moments from the movie, or imagining new adventures. Designed with a distinct, shiny exterior, Merlin the Invisible also comes with two cargo cars – one coal bin and one machinery car with gears and a piston. For even more exciting, fun-filled play, when the machinery car moves forward, the gears turn and the piston pumps! With an original look and a cool feature, Merlin the Invisible is the perfect addition to any collection of Thomas & Friends™ toy trains!